Did you know that migraine visual disturbance is often pain free and harmless? A friend of mine just gets some zigzag lightning bolts in his peripheral vision. There is no pain... and he thinks it’s fun! Do you get upsetting visual symptoms that come before a nasty attack? When I notice my vision is blurred and I feel pressure behind my eyes, I know I am in for yet another horrific migraine attack. You can use these symptoms as your early warning signal, so that you can act fast and (hopefully) stop it from turning into a full-blown assault. 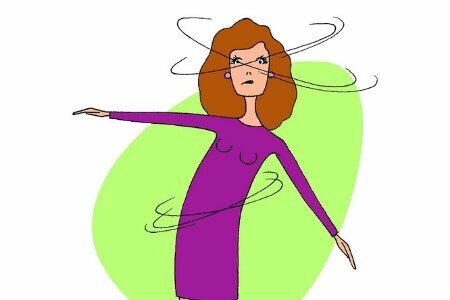 It's not just the aura symptoms you need to know about, there are others: vertigo, dry eyes, binocular blindness, visual snow... there are 6 more - Blurred Vision and Headache: 7 Symptoms You Need To Know About. But if you just get brief visual migraine disturbance symptoms that are pain free, please take a minute to count yourself lucky. 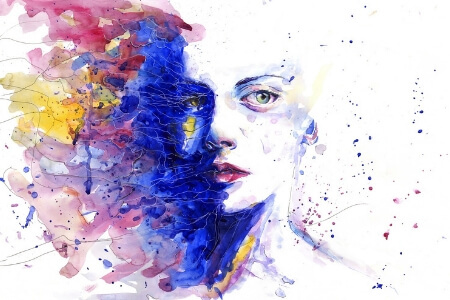 Here are some things I would recommend (pain or not) in order to reduce your visual hallucinations or to help stop them from progressing into a full-fledged migraine attack. Warning: be aware that something could be wrong if you are seeing black! No sparkling or nothing expanding, nothing annoying! If you are just seeing darkness then something might be up. Please call someone or just go to the closest emergency room at the closest hospital. It could be something more serious, like having a stroke, especially if you are unable to speak properly. You can read more about that here - Migraine Stroke Symptoms: What to Watch For. Now migraine visual disturbance may not cause pain or a full blown attack, but the symptoms can still be very scary. Not being able to see properly, especially if it happens suddenly, can impact significantly on your safety and life in general. If it passes quickly that's great, but if it doesn't here are some practical choices to help you stop it progressing to the pain phase. Act quickly to rest your eyes when you first feel the sensations of visual dysfunction. If you are working with machinery or driving, you may need to pull over or stop working right away and rest your eyes. Go somewhere where you can rest and relax. Try these acupuncture points for relief - How to Get Rid Of An Eye Migraine With These Key Acupuncture Points. I suggest seeing your doctor to make sure nothing else is wrong. 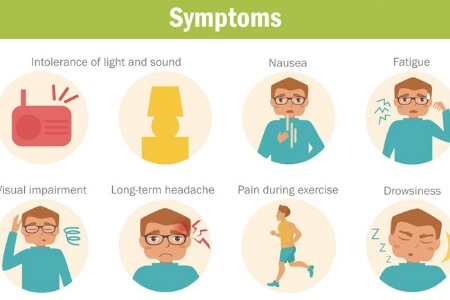 Take some notes when you have these debilitating symptoms. Keep a migraine diary to show your doctor. And you can use the records for yourself to help determine what the triggers are if your attacks get more regular. Plan ahead to find a place you can rest for 30 minutes until it passes. 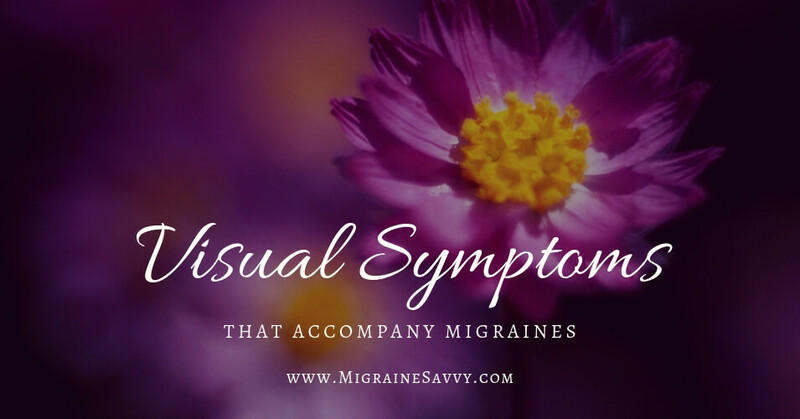 Your notes will help you to see patterns in your migraine visual disturbance occurrences. Like Bridget Jones' Diary - one hot dog, one aura, one red wine, one big zigzag! You might find you have similar triggers to a classic migraine attack: chocolate, red wine, fatigue, stress, skipping meals, and of course, eye strain. Glare can trigger a migraine and it comes from many sources - your computer screen, sunshine, off water, off snow, the car in front of you while driving, the neighbors car parked in the driveway... you get the idea. Ask your doctor for help here too. S/he can help you determine what might need to change. Once you know your triggers, you can avoid them. Wherever possible that is - see the next point for wearing protective lenses. Stress can be a migraine trigger. Have you considered reducing stress in your life? Keep reading, I will cover that in a minute! Wearing sunglasses are a good way to protect your eyes. I live in Australia and the important thing here is to wear 'sunnies' everywhere. And from birth! The baby next door has sunglasses already. (P.S. Australians shorten every word... sunglasses becomes sunnies). Proper eye protection from glare and the sun is crucial if you are prone to visual irritation. You can also get prescription precision tinted lenses for migraines. I would highly recommend trying them if your visual disturbances become more and more regular. The most common tint is FL 41, but I cannot wear that rose color, it makes me feel very anxious. I suggest seeing a qualified eye doctor that specializes in migraines and has a colorimeter for you to determine your unique color. But if they are not occurring regularly, it might be that you need do nothing! If they are regular, perhaps it's time to reduce some stress. Did your first experience frighten you? 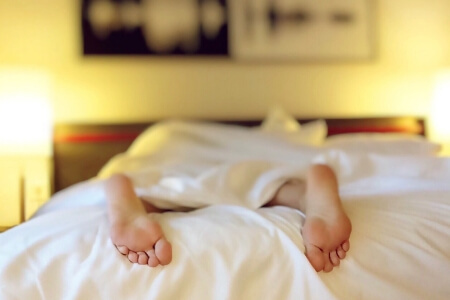 It might help to learn some relaxation techniques to lower your anxiety around it. 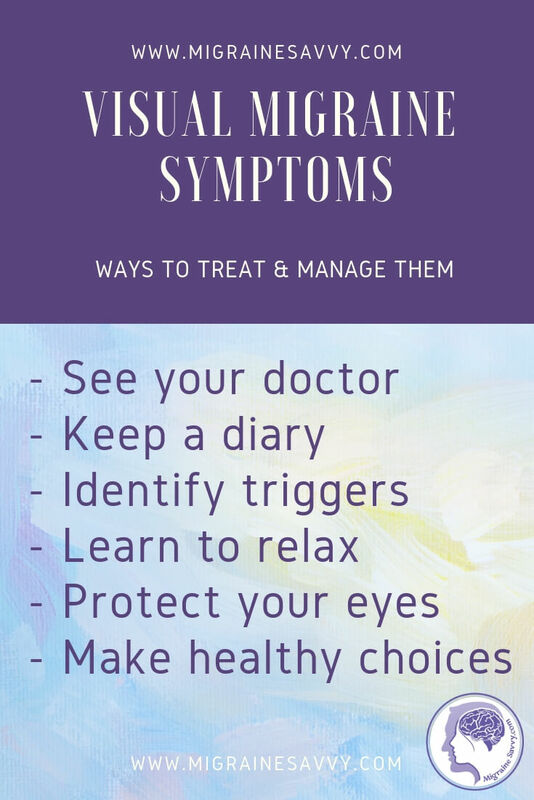 Finding out exactly what you are diagnosed with will help reduce anxiety and give you a starting point on how to best deal with your medical condition. For instant relief I use ice packs and bed rest. But if your eye problems are mild try the old slice of cold cucumber instead. Or if heat feels better, try a nice damp, hot, face wash cloth and go somewhere dark and quiet to relax for half an hour. Simple changes like scheduling in time for yourself to relax, is another good step. Exercise is always recommended to help reduce migraine attacks. Learn to meditate, experiment with biofeedback training or take a yoga class. Listen to Dr. Weil's Breathing CD, it's one of my favorites. I can recommend seeing your doctor immediately with any new symptoms that occur in your life. And with migraine visual disturbance you might also get referred to see an eye doctor or specialist. I would also suggest educating yourself on what you have been diagnosed with and learning new coping skills is essential to managing chronic conditions. Keep your eyes healthy, the best way you can. With all the tools you can.